(VOVWORLD) -President Tran Dai Quang has praised bilateral friendship and cooperation with China during his reception of the visiting Chief Justice of the Chinese Supreme People’s Court Zhou Qiang in Hanoi on Wednesday. The President expected more sharing of experience by China in judicial reform and people’s access to justice. The Chinese Chief Justice expected more cooperation in training, technological application and judicial assistance. 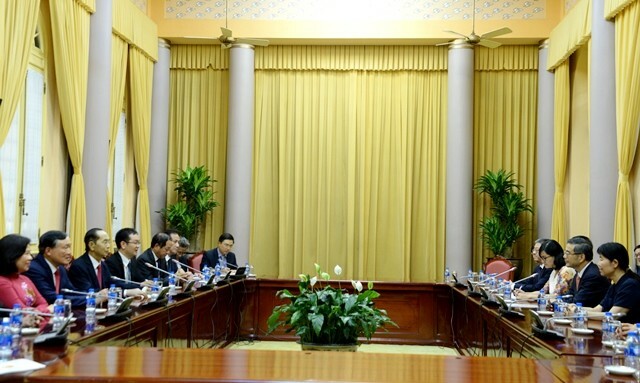 Chief Justice of the Vietnamese Supreme People’s Court Nguyen Hoa Binh held talks with his Chinese counterpart the same day to strengthen judicial and training cooperation.